One more post today about the Milwaukee Road, and its Montana passenger service. All of Montana's transcontinental railroad routes heavily advertised the state as a summer vacation destination in the early twentieth century, evoking Old West images of cowboys and Indians, along with the more contemporary lure of Montana's great National Parks. The Milwaukee was at a definite disadvantage in the latter category, since its mainline route was over 100 miles away from Yellowstone, while its competitors both served one of the parks directly. But that didn't stop them from trying. Attempting to compete in the Yellowstone travel market, the Milwaukee in 1927 constructed a handsome railroad hotel in a little branch line town named Salesville, in the Gallatin Valley southwest of Bozeman. The hotel was named the "Gallatin Gateway Inn," and the town supported the venture by renaming itself Gallatin Gateway, too. Passengers could travel to the Inn on Milwaukee trains, and then board buses for the long, scenic drive up the Gallatin Canyon to West Yellowstone. 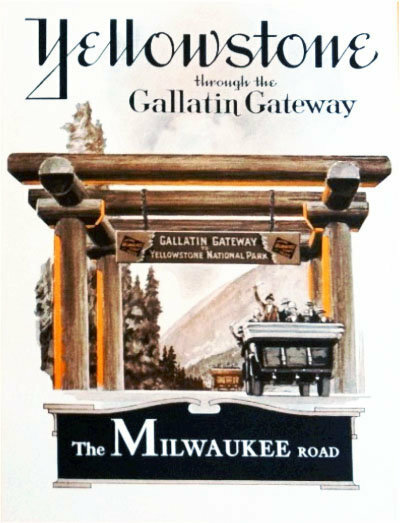 As a finishing touch to this massive promotional effort, the Milwaukee also constructed an actual Gateway, south of their hotel near the mouth of Gallatin Canyon. The imposing, pergola-like structure was a local landmark, and gave the Milwaukee's passengers a sense of arrival on their vacation. Unfortunately, the Milwaukee's Gallatin Gateway venture was less than successful overall, and the log "gateway" itself apparently survived only a few years. I know that nowadays the Montana DOT would never approve of such a thing, but wouldn't it be cool if a big log gateway still spanned US 191 at the mouth of Gallatin Canyon?